Saving you time and money, QuickScale takes accurate measurements from any PDF or scanned drawing of your plan. No need to print large drawings or spend hours measuring. This simple to use module links with our popular Estimating software allowing you to take accurate measurements from any PDF or scanned drawing of your plan - simply upload the PDF, enter the scale of the drawing, plot a known measurement and the drawing will be automatically realigned to the correct scale. Then simply import the measurements into Amtech Estimating to complete your project using Luckins Data and your own kits. The module also benefits from ‘item takeoff’, allowing you to mark and count items such as sockets and radiators on the drawing. Removing the need to have large drawings printed, or to spend hours measuring, this module saves you time and money whilst maintaining fast, accurate and comprehensive estimates. 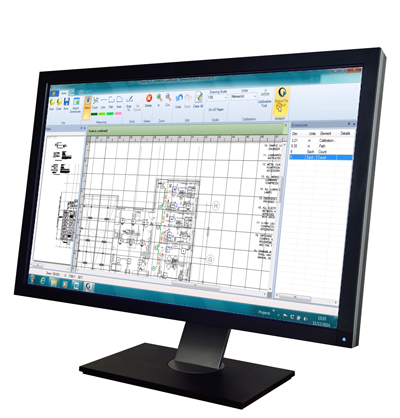 Take accurate measurements from any PDF or scanned drawing of your plans. QuickScale requires a copy of either Extreme Estimating and Enterprise Estimating. For more information about QuickScale, you can request a demo or call 0800 028 28 28.